Are you tired of playing games with your customers? The most widely used metaphors in sales are those related to sports, battle, or games. The challenge with this mindset is it requires that one person wins, and the other loses. Instead of falling victim to a win-lose approach, what if you shared a common goal with your potential client? How might things change if the client felt that you were more committed to their success than making the sale? Does it sometimes seem like you and your client are working against each other? 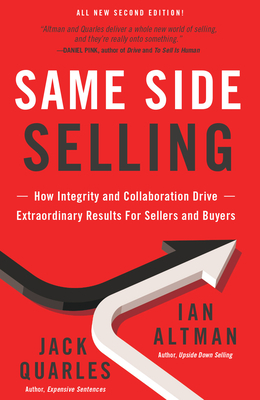 What makes Same Side Selling different from any other book on this topic is that it is co-authored by people on both sides: a salesman (Ian) and a procurement veteran who understands how companies buy (Jack). The buyer's perspective is baked into every sentence of the book, along with the seller's point of view. Our aim is to replace the adversarial trap with a cooperative, collaborative mindset. We also want to replace the old metaphor of selling as a game.